The expertise of SAP, German technology vendor in enterprise resource planning application sector cannot be questioned. Its cutting edge and next generation ERP system named S/4HANA unveiled in first quarter of 2015 was described as a huge leap forward by Bill McDermott, the CEO. It is quite natural for anyone acquainted with the services and products of SAP to think what is so remarkable about S4/HANA and what makes it radically different than the preceding iterations. The name itself holds the answer to this query. The HANA data store, unveiled by SAP in 2010 for the first time is built on a different architecture compared to typical RDBMS solutions. It runs in-memory, and has data stored in columns, thereby enabling faster, almost real-time analytics as well as computing capabilities. 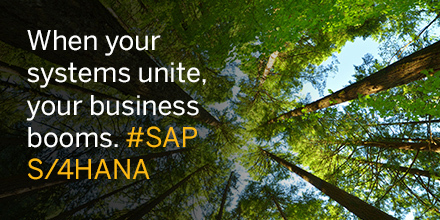 With introduction of S/4HANA, SPA is confident of delivering core ERP capabilities under one umbrella now on. However, SAP did face trouble in convincing a section of customers who are content with their prevalent ERP deployments. Moving to S/4 is deemed as not viable by all users. SAP customers can now easily deploy S/4HANA in existing data centre. They can also choose private Enterprise Cloud platform of SAP or go for public cloud with top IaaS providers like Google Cloud and Microsoft Azure. Dr Hasso Plattner, the chairman and Co-founder of SAP advisory board has admitted the company is aimed at bringing customers onto the cloud for S/4HANA. When the S/4 running in-memory is deployed the enterprise gets a streamlined and centralized business suite to offer clients enhanced flexibility. Eventually a single database is required and so database and applications grow together. Sap also implemented a number of machine learning-powered functionalities in S/4HANA through the 1709 release that came in September 2017. These predictive, intelligent capabilities are offered under Leonardo brand of SAP and the clients get real-time ERP data insights. For instance, the Cash Application software of SAP can parse through historical financial clearing data of a company and pair invoices automatically with the incoming payments. This release also comes with line-of-business cases to aid finance teams and automating processes. Now that it has spent two years since inception, S/4HANA is enjoying wider adoption by the clients worldwide. More than 6000 copies have been sold and July 2017 Q2 results of SAP reveal a 70 percent growth compared to previous year. Among the top adopters of S/4HANA is Airbus- plane manufacturer. It replaced its Oracle database two years back with SAP HANA and experienced boost in data load processing and reporting. Deloitte, a leading professional services firm has shifted to S/4HANA from SAP’s R/3. Another major company embracing S/4HANA is Northern Gas Networks- a UK based gas distributor. SAP customers however grudged about unclear migration roadmap for this tool. SAP responded by unveiling SAP Transformation Navigator tool in late 2016. Peter Maier, the SAP roadmap lead said the navigator tool answered a long standing query of its loyal customers. It has simplified migration to S/4HANA. Sap initially offered S/4HANA without charge to a few top clients in the UK and on global scale too in 2015. The final pricing however varies on size of its core HANA database, user numbers and type of deployment etc. After facing flak for lack of clarity in pricing of S/4HANA, SAP has said it will introduce simplified pricing for cloud based usage. The clients also often grudged about its complex licensing agreements. SAP corporate development officer Hala Zeine said in mid 2017 SAP is aware of these issues and will come up with flexible pricing and licensing processes minus complexity.